We thank our generous sponsors for helping us put on this class series! As you prepare for your renovation project, please support our sponsors. Registration is CLOSED for the Spring 2011 series! Don't be sad. 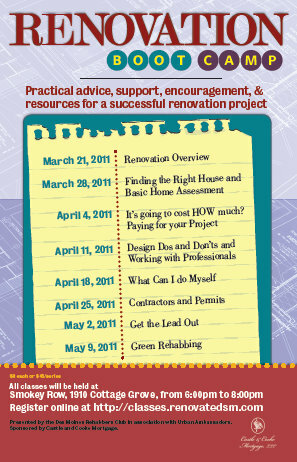 The Rehabbers Club still has monthly general meetings where you can get practical advice! Class participants learned from experts about financing, managing contractors, DIY tips, historic tax credits, picking colors, and many other interesting topics. Spring 2011 Classes were held from 6 to 8 on Mondays evenings starting on March 21, 2011 at Smokey Row. Check back for the next scheduled series. The Des Moines Rehabbers Club brings together people of all skill levels with a common interest in preservation, rehabilitation, and maintenance of Des Moines’ buildings. The Des Moines Rehabbers Club "Renovation Boot Camp" is a classroom seminar series designed to give participants a basic understanding of the renovation process from purchase to project completion. 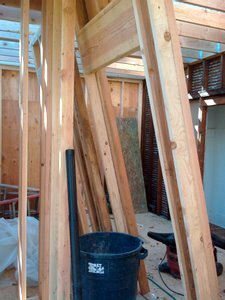 The classes will help "demystify" the process by providing practical advice, support and encouragement, and resources for a successful renovation project. Participants will be exposed to experts in each of the topics and have a chance to address individual questions. Join us for a chance to explore renovation in a safe and encouraging environment - before you spend thousands of dollars and have contractors all over your house! Renovation Boot Camp is organized by the Des Moines Rehabbers Club in conjunction with Urban Ambassadors and made possible by generous sponsorship. Can you help get the word out? Please print this poster and hang it wherever you work or hang out! Download the printable 11x17 PDF here! Classes will be held on consecutive Monday evenings starting March 21, 2011, from 6:00 to 8:00 in the back conference room at Smokey Row, 1910 Cottage Grove, in the Sherman Hill neighborhood. Light refreshments will be provided at each class, and food will be available for purchase. The Spring 2011 series is finished! When the next series is scheduled, registration information will be posted here.